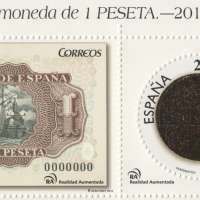 The new stamp series dedicated to the Numismatic consists of two stamps showing, respectively, the back of a peseta, 1953, and the obverse of a coin of 1 pesetas, 1944. Both values ​​are joined by the teeth and incorporate technology of Augmented Reality (AR) that captured via smartphone, refers to an animation and informative video about making notes and coins by the Fábrica Nacional de Moneda y Timbre (FNMT). In the round seal a slight relief is appreciated, and the printing system has added cool simulating metallic stamping coins. Numismatics is the science that studies the knowledge of coins and medals primarily of antiquity. Is an auxiliary science of history by the data provided, allowing to set dates, dynasties and political and economic relations between peoples when written documentation missing. For coins history of a country and its level of development is known and can be followed its evolution through those metal pieces called coins. Another aspect of numismatics is related to the art and process of minting.The oldest coins had just printed a stamp made by hammering, which over time evolved and resulted coins minted with careful motifs of gods, animals, archers, busts and equestrian figures. The artistic characters reflect the taste of time and provide information for the study of art history. Before the appearance of the coin was the exchange of products and goods among men, barter. Some time later the metal was adopted as currency trading transaction, leaving the currency regulated by the weight, the metal composition (gold, silver, bronze, copper or hybrid metals) and law (more or less pure metal that informs ). 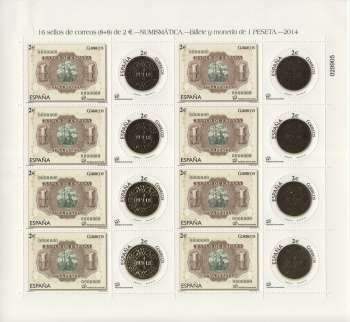 Interest in collecting coins seems that began in the late eighteenth century, but it was in the nineteenth emerged as major collectors and international numismatic societies published the first indices, catalogs and guides to collect were created.